Cox Arboretum is a private arboretum created by Tom and Evelyn Cox with over 4,000 living specimens, many of which are critically endangered. In addition to the beautiful plants, particularly conifers, it is a unique and diverse habitat with natural streams, lake, spring and stream fed pond, and over one acre wetland. Mr. Cox, a self-taught expert on conifers, retired from the Army including a tour in Vietnam then later had a second career in communications in Atlanta. Mr. Cox served as the president of the American Conifer Society and wrote the tree ordinance for Cherokee County. 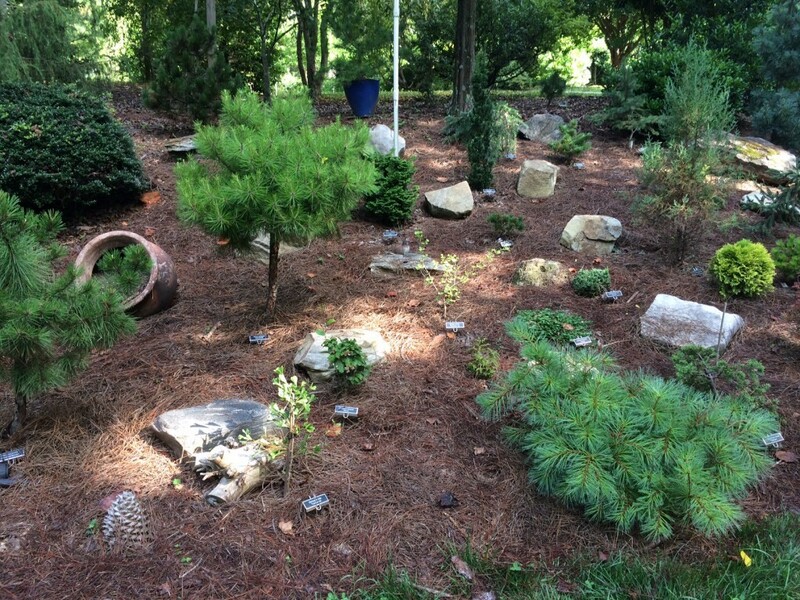 He also co-authored a book, Landscaping with Conifers and Ginko for the Southeast with UGA professor Dr. John Ruter. 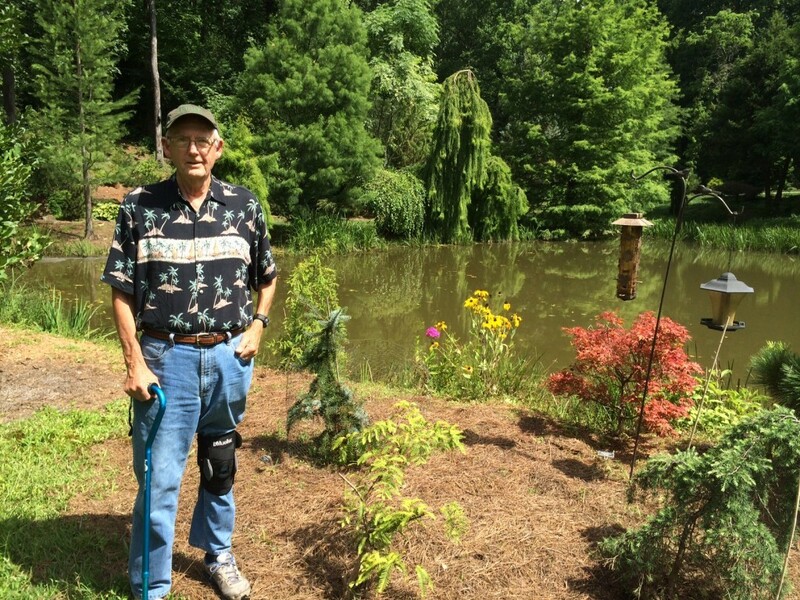 Mr. Cox stands in front of the pond in the arboretum. The arboretum is a certified Audubon habitat and is host to many resident and migratory birds. Evelyn and I bought the property in 1986 and I started establishing the trees, we built our house and formally started the arboretum in 1990. Travel, listening to music, eating good food and wine with my wife. My interest in plants and trees began as a boy when my dad would take me in the woods and tell me the names of the different trees and insects. When I was in the Army I travelled and lived in a lot of different places, including four countries, and I was always interested in the conifers because we didn’t have as much variety in the South and I found them to be very interesting and beautiful. When I moved back to the area after the Army I wanted to create a landscape that had year round interest because I felt like southern landscapes typically only have a spring show and nothing of interest the rest of the year. Keeping things alive when we first started, weeds control has always been a big part. On a long term basis, it is finding a way to preserve this property as a resource for the purpose it was intended. Walking through the arboretum now and seeing the fruits of my hard work. The arboretum has become more beautiful each year and the plants continue to reward me with their unique beauty. 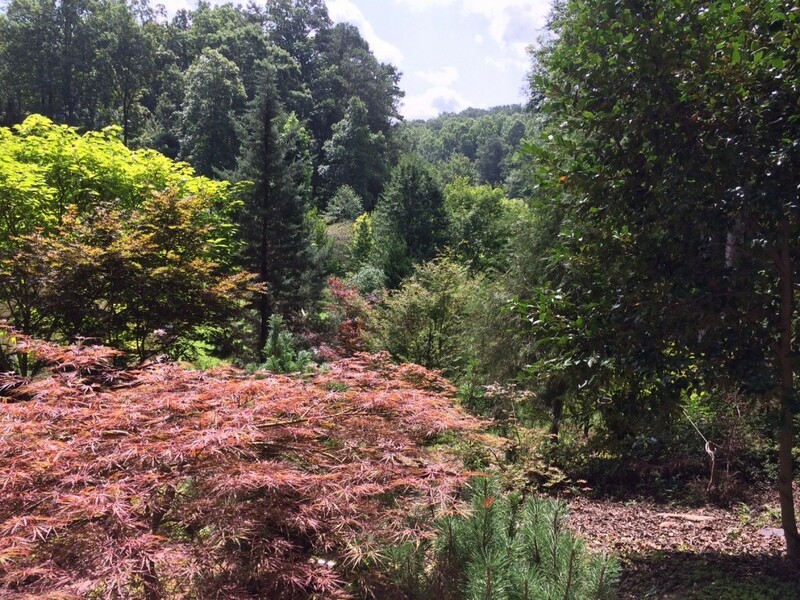 The arboretum is home to over 4,000 different plants from all over the world. With a pond, lake, streams, wetland, and varied topography the arboretum is able to showcase an incredible variety of plants. Posted in Arboretum, Cherokee County, Conifers, Trees. This entry was tagged Cherokee County, conifers, Cox Arboretum, trees. Bookmark the permalink.